Pages, A.; Perello, J.; Spadaro, S.
The spectrum-sliced elastic optical path network (SLICE) architecture has been presented as an efficient solution for flexible bandwidth allocation in optical networks. An homologous problem to the classical Routing and Wavelength Assignment (RWA) arises in such an architecture, called Routing and Spectrum Assignment (RSA). Imposed by current transmission technologies enabling the elastic optical network concept, the spectrum contiguity constraint must be ensured in the RSA problem, meaning that the bandwidth requested by any connection must be allocated over a contiguous portion of the spectrum along the path between source and destination nodes. In a dynamic network scenario, where incoming connections are established and disconnected in a quite random fashion, spectral resources tend to be highly fragmented, preventing the allocation of large contiguous spectrum portions for high data-rate connection requests. As a result, high data-rate connections experience unfairly increased bocking probability in contrast to low data-rate ones. In view of this, the present article proposes a lightpath fragmentation mechanism that makes use of the idle transponders in the source node of a high data-rate connection request to fragment it into multiple low data-rate ones, more easily allocable in the network. Besides, aiming to support such an operation, a light-weight RSA algorithm is also proposed so as to properly allocate the generated lightpath fragments over the spectrum. Benefits of the proposed approach are quantified through extensive simulations, showing drastically reduced high data-rate connection blocking probability compared to a usual contiguous bandwidth allocation, while keeping the performance of low data-rate requests to similar levels. 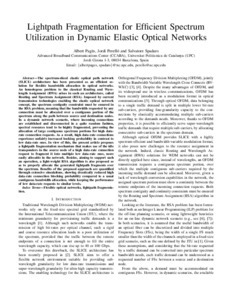 Pagès, A.; Perelló, J.; Spadaro, S. Lightpath fragmentation for efficient spectrum utilization in dynamic elastic optical networks. A: International Conference on Optical Networking Design and Modeling. "ONDM 2012: 16th International Conference on Optical Network Design and Modeling: University of Essex, April 17th-20th 2012: Colchester, Essex, UK". Essex, Colchester: Institute of Electrical and Electronics Engineers (IEEE), 2012, p. 1-6.